Krieg, Frieden und Zombies Project is an Unreal Development Kit game based on a hunt and shoot zombies gameplay. 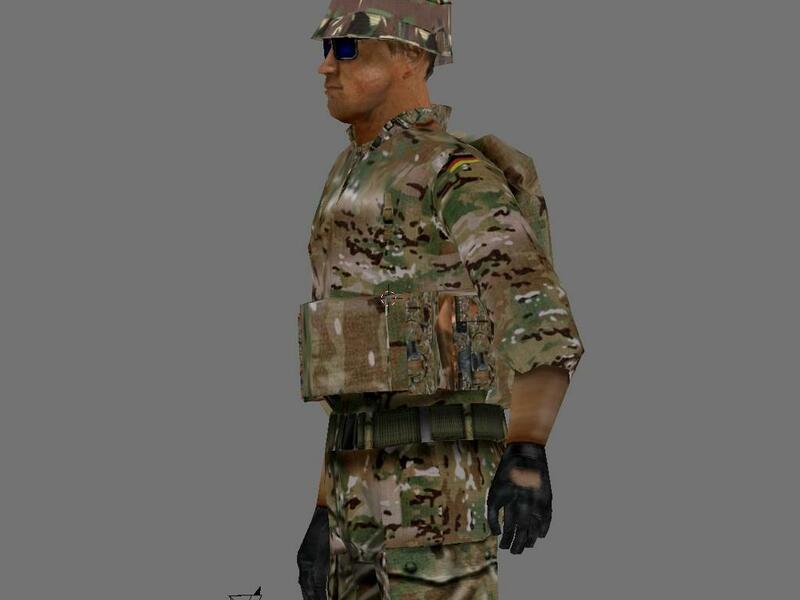 Krieg, Frieden und Zombies Project introduces new characters, weapons, vehicles, as well as destructible meshes to the mod. One such character that is new to the game is the Matriarch. Another such addition is the Challenger 2 tank. Then there are the weapons, namely, the Ultimax and the Glock. 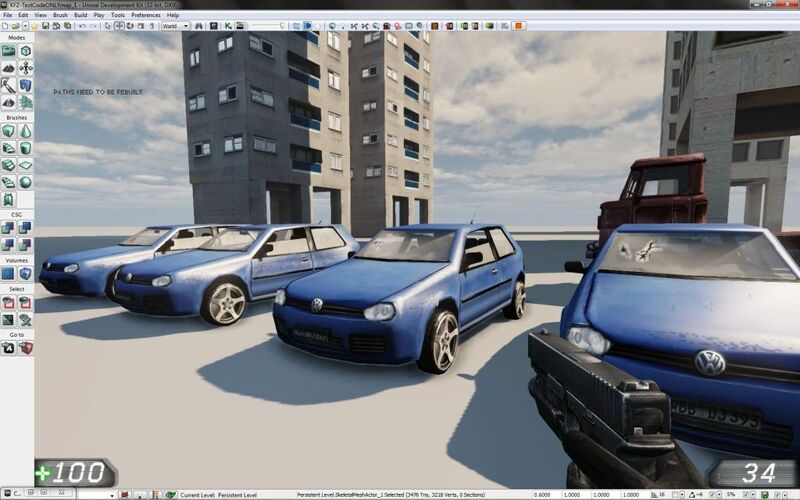 While the game started as an Unreal Tournament 2004 based, it is now being developed under the UDK engine. As with most of the UDK games being developed independently, the work is slow (progress) but it is ongoing. Needless to say, our developer needs time and inspiration to keep the game development on course. CYBORG - (in science fiction) a living being whose powers are enhanced by computer implants or mechanical body parts. Storyline, also for later: Cyborgs are welcomed into humanity. They are doctors, dentists, gardeners, labourers etc etc and so these things are being released into society as the new workers so that humanity will be free of labour. They are 'cyborgs' grown from human DNA and also integrated with mechanical parts. So there are signs around KFZ maps 'welcome cyborgs' etc, so people welcome their advent until a few people are killed accidentally by cyborgs. The cyborg project has to be stopped but the cyborgs realize that they will be terminated. They don't want to die and so the war begins, humans vs cyborgs. So cyborgs become our enemy the Zyborgs. Our mission is to stop them. These are just eye-candies for the upcoming project. * Frieg Frieden Und Zombies Developers Page - a separate KFZ forum site for more information on the UDK game. Good news. 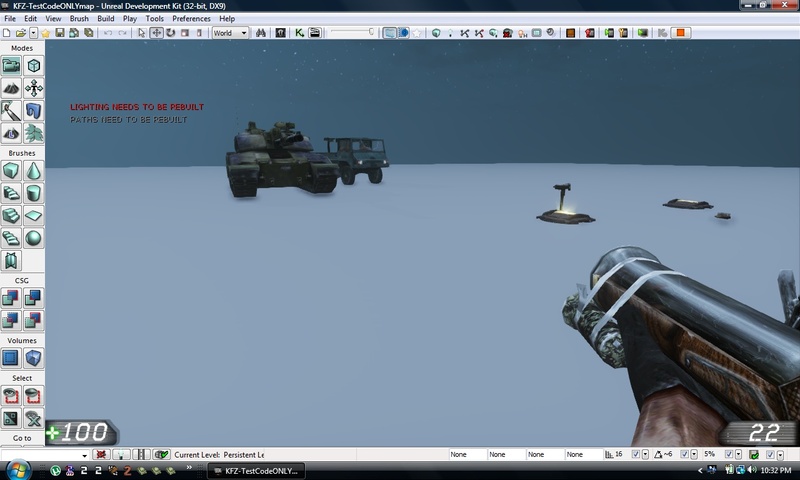 Snipe34 has been busy in working on the game's weapons animation. The video below shows the several weapons animations, sniper rifle and assault gun. As well as a semi-complete map. KFZ WIP on the Bostwick map by Snipe34. First of the few being made for the game. Snipe34 is slowly working on his low poly destructibles like the human skull inspired by Vanico. The development is going steadily forward with a rendering of the female character. The progress may seem slow but it is sure. A couple of item are introduced to the game. Download this executable files to convert UT2004 to UT3 maps. why did i never see this ?! Why did I never see this?! As poom was saying, previously we were continuing the KFMod and developing a Storymode version. But Tripwire Interactive mailed me and said: they bought the KFMod and they own its rights, so the KFMod can not be developed further. Fair enough, I should have realized. Tripwire were nice enough about. From what I last heard they're now developing a free Storymode addon for their KF retail version. I wrote an in-depth plan of what's needed so probably that will help them. But for me, I had a stack of unique content from developing Storymode KF: vehicles, weapons, static meshes and I wanted to continue somehow, so I decided to move it to a new mod using UDK. The new mod: Krieg, Frieden und Zombies (or in English: War, Peace and Zombies) will be a mission type game, which will obviously not infringe on any of Tripwire's copyrights. Poom looks after the ModDB end of it, besides harassing me to hurry up, and he will be keeping ModDB info updated. Hoping that clears up some misunderstandings. Exactly, as snipe34 said: poompoom500 looks after the modDB site. snipe34 is the main developer and I help with development. We are all from the forum UnShame has mentioned. It's going to be released as a stand-alone. I have no idea why this is here either. Meanwhile, visit Miasma.org. Same reply as below to UnShame.